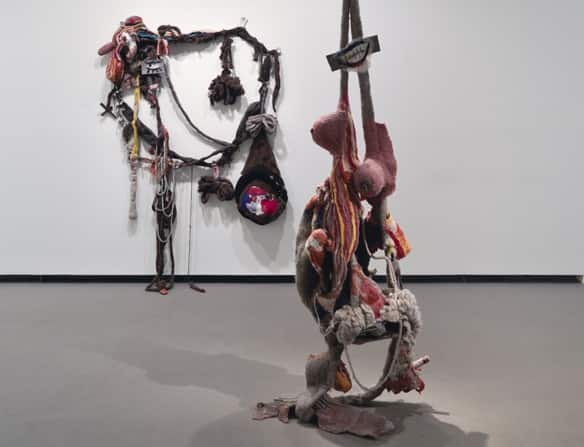 The Sobey Art Prize is around the corner, and while this year it’s impossible to predict, rumour has it that it may be Shary Boyle. Ontario has yet to win, and Shary Boyle has had a great few years, with national and international exhibitions, museum shows and a gorgeous hard cover catalogue on her work. David Altmejd has a big champion on the jury – Louise Dery, the director of Montreal’s UQAM gallery, who took to Venice as Canada’s representative in 2007. But Quebec has won twice, with Jean-Pierre Gauthier in 2004 and Michel de Broin in 2007. We also hear that the Sobey’s themselves have noted, publicly that an artist from eastern Canada has yet to win, so…Graeme Patterson? VoCA doesn’t think it’s his year. If VoCA was judging based on art alone, we would probably choose Luanne Martineau, but that’s moot, since the prize is likely neither based on art alone nor are we judging. The 2009 Sobey Art Award Curatorial Panel comprises: Liz Wylie, Curator, Kelowna Art Gallery; Kitty Scott, Director, Visual Arts – The Banff Centre; Ivan Jurakic, Curator, Cambridge Galleries; Louise Déry, Director, Galerie de l’UQAM; Terry Graff, Curator & Deputy Director; Beaverbrook Art Gallery. Given that only one woman – Annie Pootoogook – has won the Sobey, we do hope a woman wins this year. For the Sobey Prize website, please click HERE. Stay tuned to VoCA for the winner’s announcement on October 15. ← Toronto: Nuit Blanche 2009, Part Two. Parkdale. Well sheesh, it SHOULD be about the art, and not about being geographically “fair”. But then again, why bother splitting the nominees into regions if it isn’t also about geography? But you’re right: the prize is likely not based on art alone. Looking forward to the announcement, and my fingers are also crossed for Shary Boyle. I think Marcel’s time is up! Wes, I can definitely sympathize. I was actually kind of surprised that he’s on this list at all; it’s time we honour Canadian artists actually making work here.